Our WLS Jog-A-Thon 2018 will be taking place on Thursday, November 8th. Those that participated last year will remember what a fun time it was and that we raised enough money to replace the playground turf for our students. This year our goal is to raise money to install an outdoor sport court. In addition to these exciting possibilities, the Jog-A-Thon is a fun day that promotes good health and an active life style. This project will benefit all students so it is very important that all families participate. We have made it easier than ever for friends and family to donate through Pledgestar at http://pledgestar.com/Westchester. Each student will have a log in for pledges. Please contact your student to get their passcode for pledging. Support our School and Advertise your business! 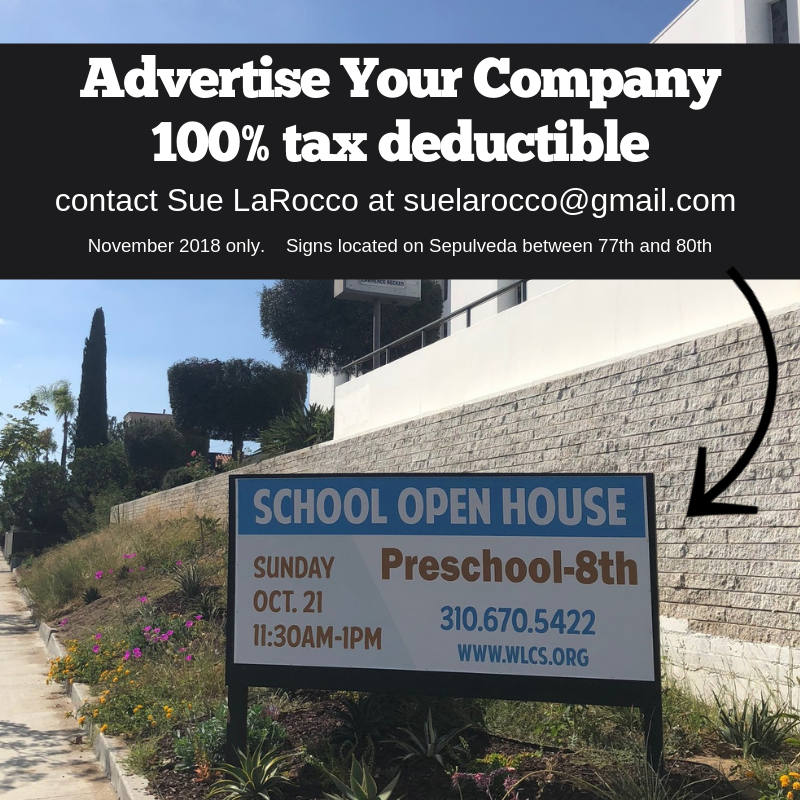 We are reaching out to all companies, foundations, local business and families with a great opportunity to support our school and community by making a 100% tax-deductible donation. We created multiple ways in which you can show support. Sponsorship banners will go up as soon as the sponsorship form and payment are received. BILLBOARD SPONSORSHIPS - only 3 available! • Includes: two 3.5’hx5’w banners displayed on Sepulveda Blvd. (on sign boards on Sepulveda) visible to traffic. • Banner will be displayed for approximately one month. • We will offer you the opportunity to include one marketing flyer to be included in our Monday Envelopes, which goes home with all students JK-8th grade. • Your company name will be included on a list of sponsors sent home with each student, on our website and in our Wolfpack Weekly newsletter. • One 3.5’hx5’w banner displayed on the driveway wall on school grounds for approximately one month which will be visible to all school families who drive through at least 2 times per day.